Exposure is not a problem with these creative Flat Top Tins. Featuring your custom imprint on the lid. Mint flavors come in Peppermint, Wintergreen, Cinnamon and Spearmint. Padprint: Set-up charge $50(V) per color. Additional color run charge $.30(V) per piece. Re-order setup charge $30(V) per color (Run charges apply). Customize the mint shapes to match your logo or promotion! 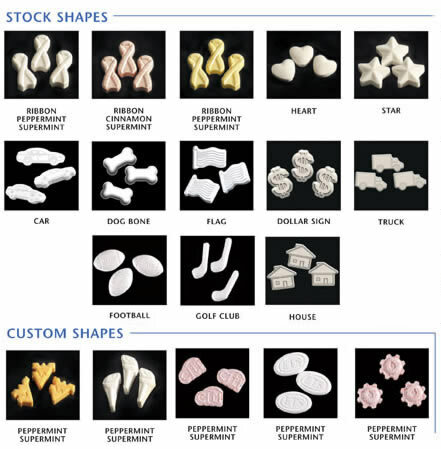 Please contact us and we will be happy to provide a quote for custom shaped mints.